As a resident of southern Ohio, it’s pretty easy to assume that I am not in the center of a hotbed of vehicle testing—honestly, the most exotic vehicular event in the area is that there is supposedly some guy who shows up to watch Bengals games in a Lamborghini. At all other times, the roads where I live are filled with your normal bland assortment of trucks, Jeep SUVs, and late-’90s sedans. So, when I saw a car with a squirrely paint job while driving home on I-75 late last night (coming from doing something totally cool, and not at all nerdy), I assumed some dude had just decided that he was sick of your car-painting conventions, man. Then I noticed that the badges were missing. And the license plate was painted white. And the door panels, rear bumper sensors, and wheel wells were outlined in black tape. It was, to all appearances, a test vehicle. I am actually far more certain that it was now that I have done a little more research–the car’s license plate (which you unfortunately can’t see in these photos) looks to be a vehicle manufacturer license plate, consisting of six numbers and a small “M” in the center. I managed to snap some pictures on my phone. I apologize for the poor quality, but this was done without looking at the phone, taking pictures out the window with one hand at 11pm with Dayton/Moraine in the background. After looking over the few photos I had, my fellow editors and I can to the conclusion that this is probably a 2018 Chevy Malibu. 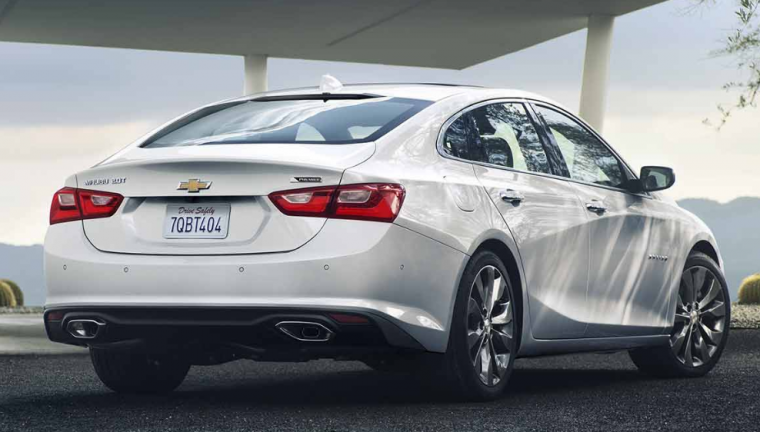 First of all, this choice was based off the fact that the Malibu received a redesign semi-recently for the 2016 model year, so wouldn’t likely see any exterior changes yet. 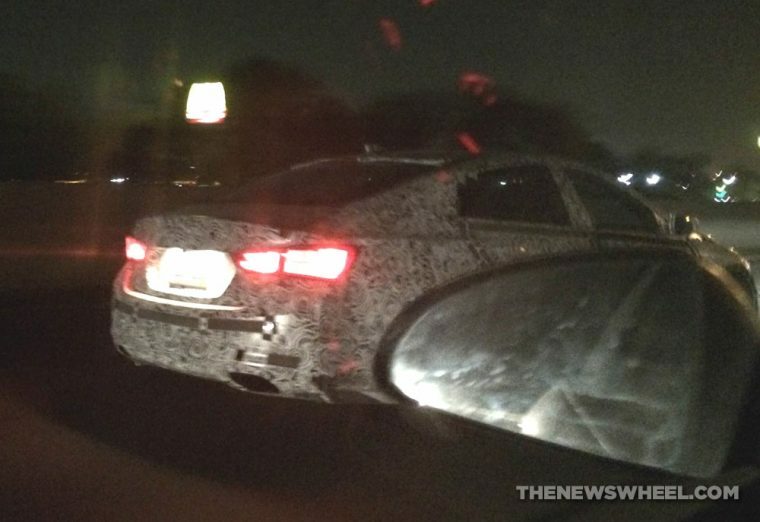 Then, since the sedan is currently in the 2017 model year, it seems unlikely that Chevy would be using camouflaged vehicles to test that model. Then there was the exterior of the car. 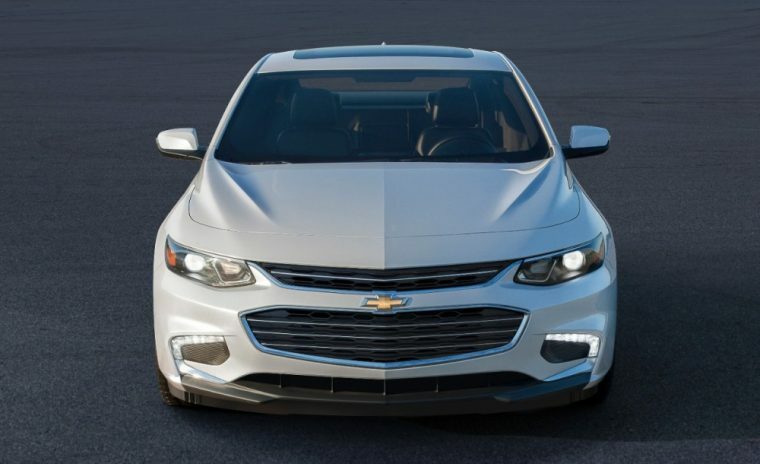 Although I couldn’t get a clear photo of the front end without potentially finding out what guard rails taste like, I did manage a good look in my mirror, which revealed a set of headlights laid out with a definite horizontal line across the top (just like those on the 2016/2017 Malibu). However, the real kicker was the rear side panels. Those are some long, defined body creases leading all the way from the rear doors to the integrated rear spoiler. It seems that the only physical change to the exterior is the possible removal of the porthole windows in the vary rear of the car, although they may just be covered by the camouflage. Either way, Chevrolet hasn’t revealed any information on the 2018 model year (especially since it just recently began selling the 2017 models), so this may be out first glimpse of a vehicle that is a year out from being released.